PLEASE NOTE, DECKING IS NOT INCLUDED. This hand crafted garden room, comes complete with a polypropylene roof to shelter from the elements but also allows the sun to shine through. 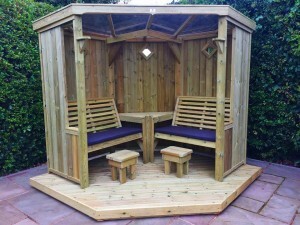 It is fully pressure treated for longevity and is fitted with two comfortable benches which will sit a total of four adults. There is a functional corner table where you can put your drinks.